Set during the French Revolution, We. 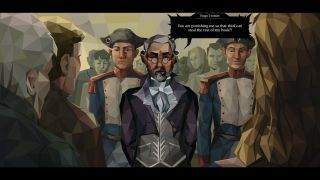 The Revolution puts you in the role of a judge of the Revolutionary Tribunal tasked with passing sentences and, ideally, not being sent to your death. Presiding over court cases and doling out verdicts will shape the course of history, but you’ll also be dealing with more intimate family matters. Studio Polyslash describes the game as “blending case-building with intrigue-crafting and turn-based tactics”. It’s also got a lovely art style, and is attracting a fair bit of Steam review buzz. Definitely worth a look for fans of morally ambiguous drama, Papers, Please etc. Astrox Imperium is an open world space RPG inspired by the likes of Homeworld and EVE. It’s single-player only, and looks to be about as open-ended as you could want from a sprawling exploration game: there are over 100 maps all strewn with different stuff to discover and mine. “I wanted a single player, open-world space game that is similar to games I enjoyed, like Homeworld and EVE, with economies, factions, and a story,” says its creator Jace Masula, “a game where I could set all the parameters, and the universe would come alive with new challenges each time I played.” It’s in Early Access but only for around 6-8 months. Launched into Early Access last week, 1001st Hyper Tower is a first-person shooter rogue-lite, which aren’t exactly thin on the ground at the moment. But I like this one’s twist: you’re basically scaling a ginormous destructible skyscraper fashioned after the Dubai skyline, with the objective of breaching the top. The graphics are charmingly chunky, and there are over 60 different weapons and even more enemy types (though in this Early Access build it’s closer to around 30). The developer reckons it’ll launch into 1.0 by July 2019. If you’re a fan of climbing dizzyingly high structures (who isn’t? ), this looks irresistible. Final Assault is a real-time strategy game set during the Second World War, which wouldn’t be such a surprising thing if it weren’t for it also being a VR game. With either an Oculus or Vive, you’ll be presiding over battlegrounds using motion controllers to interact with the minuscule warmongers below. It’s a smart use of VR tech and, frankly, it’s surprising that more RTS games don’t boast this kind of support. There’s a story campaign, PVE and PVP play, and two starting factions in the form of USA and Germany. I don’t think I can really improve on the studio’s own description of Terrorarium: “[a game about] wanton destruction and adorable gore in player-made murder gardens.” Murder gardens really is a discomforting term, isn’t it? But Terrorarium is surprisingly cute given its premise, and it looks like only monsters and plants are getting killed. It’s very much a sandbox game, with the focus being on creating and sharing your own foliage carnage set pieces. It’s in Early Access for up to a year. These games were released between March 18 and March 25 2019. Some online stores give us a small cut if you buy something through one of our links. Read our affiliate policy for more info.